Watch Collingwood's dynamic midfield duo - Dane Swan and Scott Pendlebury - at their best in 2013. Watch the highlights of two of Collingwood's main midfield stars - Dane Swan and Scott Pendlebury - after they were named in the 2013 All-Australian team. 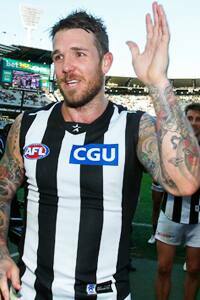 Dane Swan was named in the All-Australian team for the fifth consecutive year. Collingwood’s Travis Cloke, Scott Pendlebury and Dane Swan have been recognised for their impressive performances during the 2013 season with selection in the AFL All-Australian team. Consolidating their status among the AFL’s crop of elite stars, the trio once again proved influential in helping drive Collingwood to an eighth successive finals campaign, the second longest streak in the club’s storied 121-year history. Though Collingwood was ultimately stymied in its bid for greater success by Port Adelaide in the opening week of the finals series, the continued dominance of the Magpie All-Australians reaffirms that the club is on strong footing to maintain its Premiership aspirations in the seasons ahead. Director of Football Rodney Eade hailed Cloke, Pendlebury and Swan’s selection as a just reward for their efforts over the course of the year, lauding their consistency as each further established himself as a multiple All-Australian. “I think it’s great for the three players to receive recognition as All-Australians and is testament to the respective seasons they’ve enjoyed,” Eade said. “Scott has been super consistent and very rarely played a poor game this year. His quality of output has been excellent. “Dane has had another terrific and has been awarded his fifth All-Australian selection, which is a sign of his consistency over a long period of time; particularly over the latter half of this year where he recaptured the form he had demonstrated in 2010 and 2011. Selected at Centre Half Forward, Cloke’s 68 goals saw him become an All-Australian for the second time in his career, having previously been awarded in 2011 as Collingwood reached the Grand Final. Averaging nearly 30 disposals, over five tackles and five clearances per game in 23 outings in 2013, Pendlebury was named on the wing as he achieved All-Australian status for the fourth consecutive season, becoming only the third Magpie to achieve such recognition on more than three occasions. Swan meanwhile continues to etch his name in the history books as one of the most decorated players ever to don the Black and White, with his fifth All-Australian guernsey placing him only one selection behind current senior coach Nathan Buckley, who holds the current Collingwood record. *Luke Ball was named in the 2005 All-Australian team while playing for St Kilda.